Ray Kane of the Defence Forces won the April Open in a hotly contested final that wasn't certain until the last shot. With one shot left, Ray led runner up Val Pierce by the barest minimum of 0.1. Before that, with three shots to go, Ray Reilly (who eventually finished third) and Val Pierce were tied on 214.7 with Ray Kane just 0.1 behind on 214.6. Thanks to all who turned up and entered. The next indoor competition is the National Championships in June (date TBA). Indoor (25 yard) classification list which is extracted from the results database every time it is updated. Classification is based on the last three results for each compeitor and is limited to results from the last two years. Class cut offs are roughly broken down to equal segments and class boundaries are adjusted accordingly. The current classification is based on the following criteria. Class A: 605 and above. Class B: Between 590 and 605. Class C: Between 560 and 590. Class D: Below 560. These are based on decimal scoring and include the latest results. Congratulations to Siobhan Scarlett of Dublin University Rifle Club (DURC) who won the Dave Cullen Memorial Shoot after a very close and interesting final. Siobhan scored a 247.2 to take the gold medal with a 0.4 point margin from Ray Kane of the Defence Force Shooting Team (DFST) who scored a 246.8. Sean Baldwin (DFST) claimed Bronze medal with a 224.9. Not only did Siobhan win the gold but she was also presented with the Dave Cullen Memorial trophy. 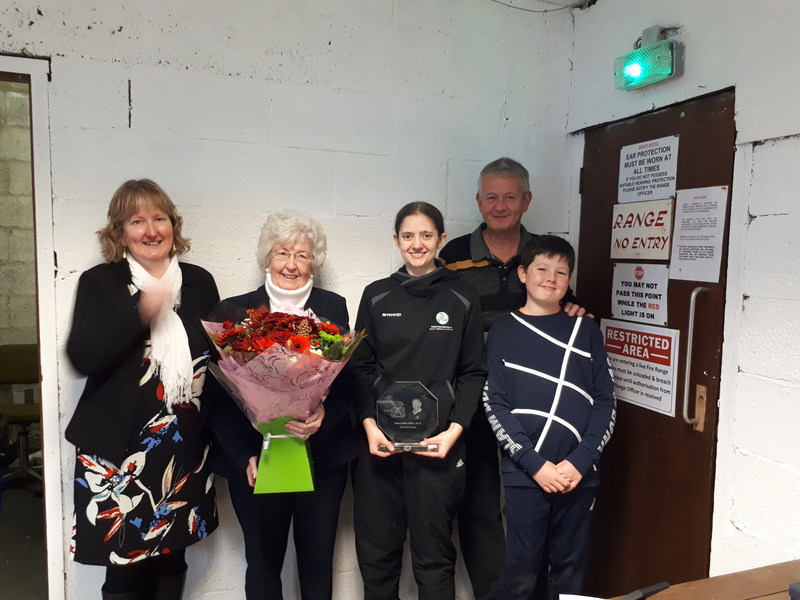 It was very special that Eileen Cullen presented the trophy and that other members of the Cullen family including Anne-Marie, Pat and Padraig presented the other prizes on the day. Unfortunately, Dave's son Seamus was in the USA and was unable to attend this year. It was a great occasion in memory of a great man. Congratulations to Stephen Murphy of Dublin University Rifle Club (DURC) who won today's Airgun final with a final score of 246.6 Stephen qualified for the final with a very impressive PB of 623.5 (with 44 inner tens). The final was very close throughout and after 12 shots, Stephen was in joint first place with Jinxin Zhang (DURC). He took the lead after the 14th shot but was pushed all the way by Ciara Deevy (DURC) who claimed 2nd place with a score of 242.1. Jinxin went on the complete a top three for DURC winning the bronze medal. In the Pistol competition, Tomas Jakubauskas of (WTSC) took the gold medal with a score of 555. Many thanks to all who competed on the day. It was great to see so many shooters (new and not so new). Hopefully we will see many more in future competitions. Congratulations to Siobhan Scarlett who is the Wicklow Open 2018 Champion. Siobhan (Dublin University Rifle Club) stormed into the final with a very impressive 621+ score in qualification with 39 inner 10s. In the final Siobhan took the lead at around the 12 shot and her consistency and accuracy resulted in a 5.7 point winning margin over Sean R Baldwin of the Defence Forces Shooting Team. Peter Daynes of Rathdrum Rifle & Pistol Club claimed Bronze. RRPC were delighted to have a total of 3 finalist on the day with shooters Val Pierce and Nick West joining Peter. Afterwards a slow but very tasty BBQ was held with lots of food and craic had. A huge thanks to all that participated on the day, Kealan Symes for running the final and all those who helped with the BBQ.